Vista's Disk Management utility can partition your hard drive with ease. As I wrote the other day, I'm making my way to Windows 7 a little bit at a time. It's getting a fresh install on a new hard-drive partition, then a gradual load of software, settings, and data. 1. To create a new partition in Vista, click the Start button, type diskmgmt.msc, and press Enter to open the Disk Management utility. 2. 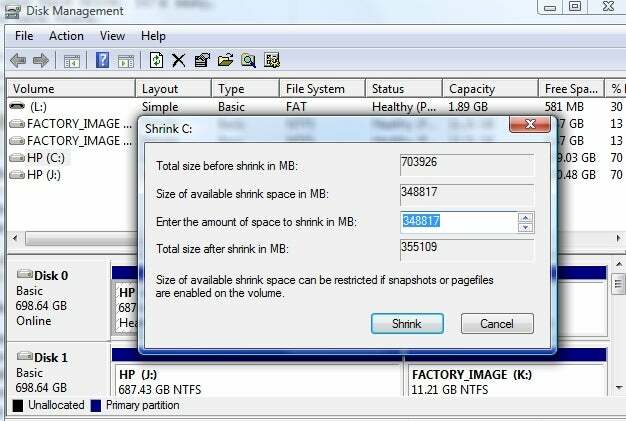 In the Volume column, find your C: drive, right-click it, and choose Shrink Volume. 4. With that step done (or not, if you're okay with Vista's default findings), enter a size for your new volume (I entered 300000 for 300GB, for example) and click OK. After a few minutes, Disk Management will show you a new "Unallocated" space on your drive. 5. Right click Unallocated, choose New Simple Volume, and then follow the steps indicated by the utility. When you're done, you'll have a brand spankin' new partition that's ready to receive Windows 7. I'll cover that part of the process next week. Stay tuned!